What a way to start a shunga album! 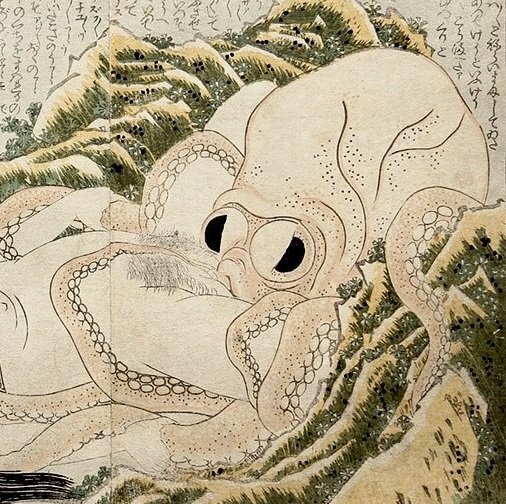 Hokusai‘s The Adonis Plant (Fukujuso) begins with this deviating image of a reclining, sensuous and sophisticated female who is holding her chubby, aggressive little infant. The ukiyo-e expert Richard Lane doesn’t think so. Despite the revealing pubic details, it is more a kind of bawdy joke. The focus is not really on true eroticism. He compares it with the scene displaying foreign high-class girls harassing a Japanese passerby (Fig.2. )*, although it is even less revealing of the sexual parts. The ‘Mother and Child’ design represents a strong contrast to Hokusai’s usual and more conventional depictions of lusty wives. 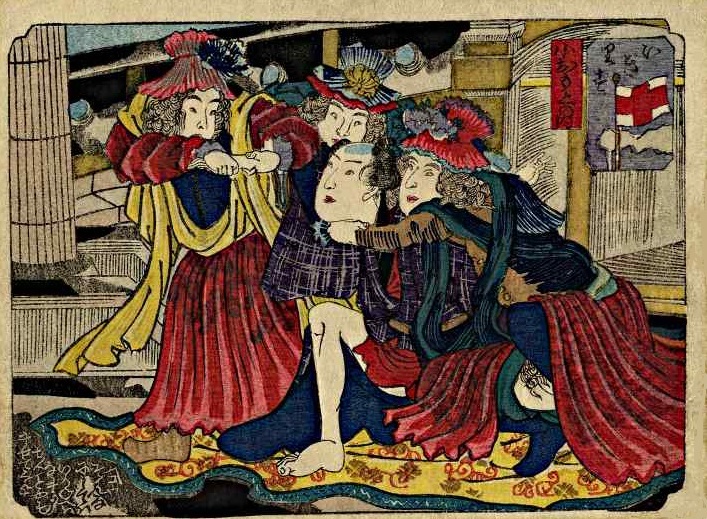 It’s a kind of variation on the well-known opening tableau to Hokusai’s The Horny God of Izumo (c.1823), in which the violent sexual antics of man and wife arouse their young servant-lad to masturbation (Fig.3.). Click HERE for an earlier post on another compelling design from the Fukujuso-series…!!! What are your thoughts on Hokusai’s ‘Mother and Child‘ design? Do you think it is a shunga?